Finding the right words for a Retirement Card Message is difficult, and most will struggle with it. Often people you know, be they friends, family or work colleagues, will retire at some point and sending them a card wishing them the best or congratulating them on a lifetime of work is a thoughtful gesture that they will undoubtedly appreciate. But knowing the right words to use, being able to express what you feel and avoiding horrible or cheesy clichés is tricky. That’s why we’re here to help. 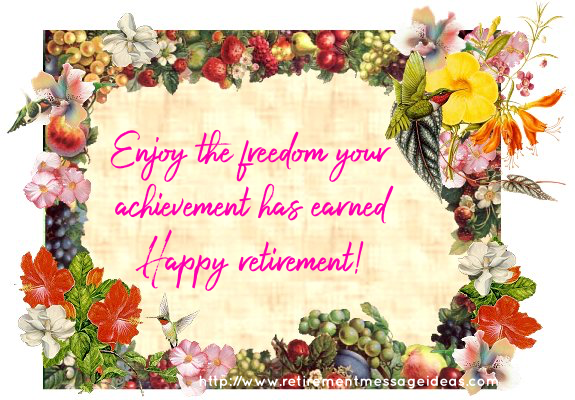 We’ve put together a wide range of retirement card messages that will hopefully provide you with inspiration and ideas to craft your own sentiments and messages, or just a quick and easy copying of a pre-written example that are free to use. These will ensure that you won’t have to worry about what to say from now on, and any time yiu require a Retirement message you know there is a simple to use resource out there for you. So give some of the retirement card messages and wishes listed below a try as you should find at least a handful suitable for any card. Alternatively go back to the home page and use the categories provided to find a more exact match for your card, be that a poem, funny message, retirement quote or more. May you enjoy a successful life after retirement to the fullest. Enjoy the freedom your achievement has earned. Happy retirement. Time to relax and do whatever you want! Congratulations! It’s great to see someone retire who is as deserving as you. Make sure you work just as hard at relaxing as you have in your long career. Relax and have fun, but don’t let retirement douse the fire in your belly. Farewell and goodbye. Here’s to you and your family: success and a bright future with the time to do the things you have always wanted to do. You will be missed. I am happy to see you retire at just the perfect time. Actually, any time is the perfect time to retire. Retirement is wonderful if you have two essentials: much to live on and much to live for. We’ve always enjoyed your company here at work and we’re really going to miss you a lot. Best of luck. We’re so glad that you are retiring, since we’ll get to spend a whole lot more time with you. Thanks for your advice, dedication, and helpfulness. We will miss you. Appreciate all your kind words and teachings. We will miss you. You have taught me so much. I hate to see you go, but am so happy for you and your family’s new life. Enjoy! While you are out having a good time and living the great life, think of us here back at work. Happy, Happy retirement day. You have earned it. Thankful for all we shared. You were more than just a co-worker, you were my friend. Already missing you, but now you have to go! You finally are here! Welcome to retirement! Let’s have some fun! You earned your retirement, but now it is time to have some fun! Excited to see you fulfill your lifelong dreams. To my dearest friend, excited to watch you during this time of freedom. We have enjoyed you! Now, it is time to enjoy yourself! Thanks for all your hard work through your working years! Retiring is your new key to success! Live it up during retirement! May retirement be what you dreamed of! You will be missed, but happy for your new adventure! It is official, gardening, fishing, and tinkering are all new job duties. Having someone like you as a co-worker has been no less than a gift. Wishing you a wonderful retired life ahead!! You will be missed, but never forgotten. Retirement means you will have more time to invest in the things you want to do. May your retirement lead to new success in whatever you pursue. Your life’s work has made a difference! Knowing that have a relaxing retirement. You made this a great place to work! We will miss your smiling face, and hope that you’ll visit us when you have time. Farewell partner! You have worked so hard for this day to come and have done such a wonderful job. May you have a relaxing retirement, knowing that your life’s work has made a difference! Celebrate an end of an era and the start of a brand new chapter. We still can’t imagine working here without you, but I guess we’ll have to manage somehow. Thank you for your years of dedicated service. No more Mondays for you! Happy retirement. It is the special time for you to fill your days with enjoyment for the rest of your life. A very special time to look back on your days with satisfaction and look ahead for the upcoming days with anticipation. We will always remember you for the days spent with your encouragement and support. We are really going to miss you; we will always keep you in our hearts! I just want to say, “Thank You.” You always listened, you always had something constructive to say, and you always offered support and encouragement with an unflagging spirit. I’ve learned so much from you, and I will miss working with you. Keep in touch, please. Can you imagine hours and hours of enjoying your hobbies, days and days of doing whatever you want? You are one lucky person. Best wishes on your retirement. I wish for you joy and happiness as you begin your retirement. Now that you have finally slowed down, use this time to do the things that you never got done in your own life. Today is the beginning of the rest of your life and I know that just as you worked hard in your job, you will work even harder to enjoy your retirement. Relax and have fun, but don’t let retirement douse the fire in your belly. In terms of profit and loss, your retirement is a loss for your colleagues and a profit for your family. Farewell. We never had a dull moment or a slow day in the office when you were around. Even though you were the eldest, your spirit was the youngest. Goodbye. Life is so much better when you don’t have to follow an agenda or set an alarm clock. Even though you’re through with work, we know you’ll be busier than ever. There is no rest for the wicked! What? Are you old enough to be retiring? I would be happy for you if I wasn’t so envious. I hope your retirement is the best time of your life! Enjoy! We wish you the best. We hope your retirement is filled with happiness! You have been a valued asset at this company, and we are sad to see you go. If you put as much effort into enjoying your retirement as you have all the years you’ve been working, you’ll have an amazing, productive, dynamic and long lasting retirement. You deserve it! Your new job now is to ensure that you enjoy your retirement. The hours are flexible, and you have complete autonomy. Now that you’re retired, you’re going to have to find something new to complain about. Don’t worry, it’s comes pretty naturally. Some people say that retirement signifies the end of all of life’s tension, but that’s true only if you have a grand pension. You’ve saved the best years for last! Anyone who complains about being put out to pasture has been in the harness too long. Enjoy your retirement! Thanks for your best years, enjoy your rest years!